It is fully editable. Students read a short text and do the tasks described in it. They must classify the given words into three categories: write out the ailments and mark the picture, make up a prescription, and create a Health Supporting Lifestyle List. 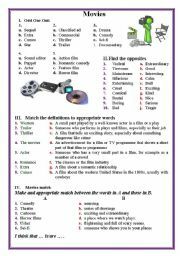 Read and match worksheet. 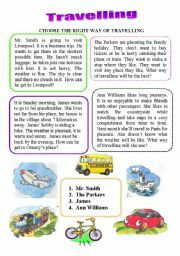 While doing this task children don�t even mention that they practise reading. Here you can find five activities about movies. Some of them are vocabulary exercises, the others are for developing speaking. 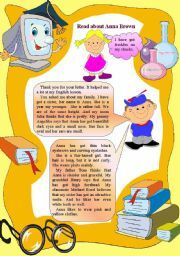 I prepared this WS for tomorrow�s lesson in my class. 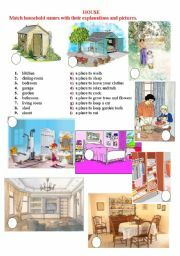 After matching the names of cooking utensils with the pictures my students are supposed to tell how these utensils be used while cooking. Yesterday I failed to upload my Wss. So, here is the third part of them. Reading, true/false and matching. 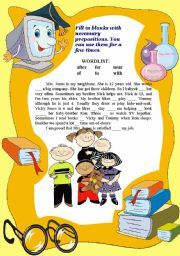 Here you will find gap-filling, matching and writing exercises. The main purpose of which is to revise vocabulary on describing people (traits of character). 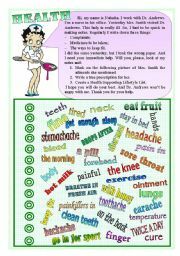 This Ws is good to practice vocabulary. You can also develop speaking skills with its help. The fourth part of Wss. 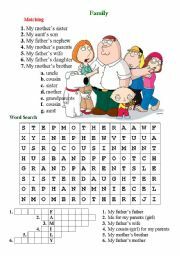 Two wordsearches (plain+opposites) and answer sheet.